Above, the very attractive home of the Whittle Music Co., which sat at 1108 Elm Street on the southwest corner of Elm and Murphy. 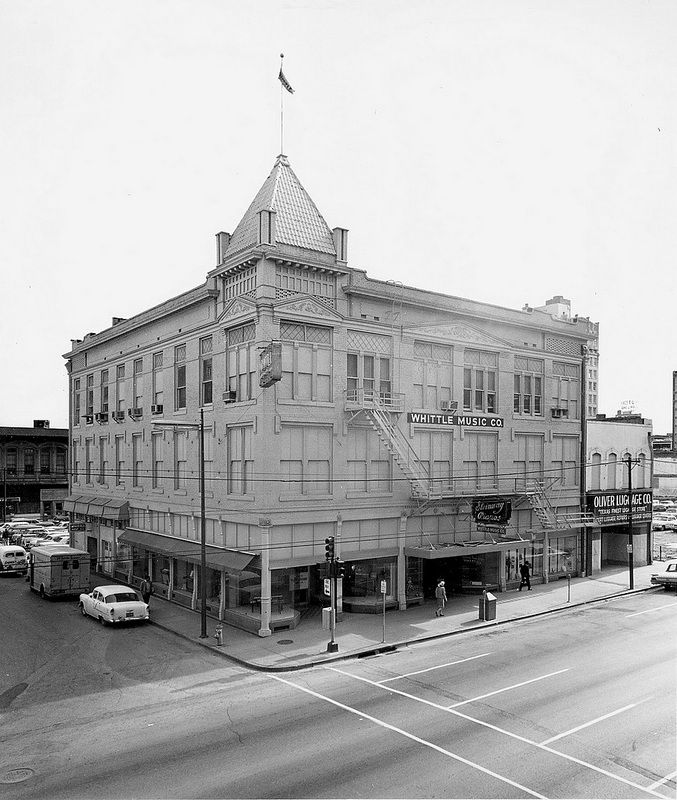 It was built as a two-story building in 1892 for the A. Harris Co., one of Dallas’ earliest department stores. A third floor was added in 1899. 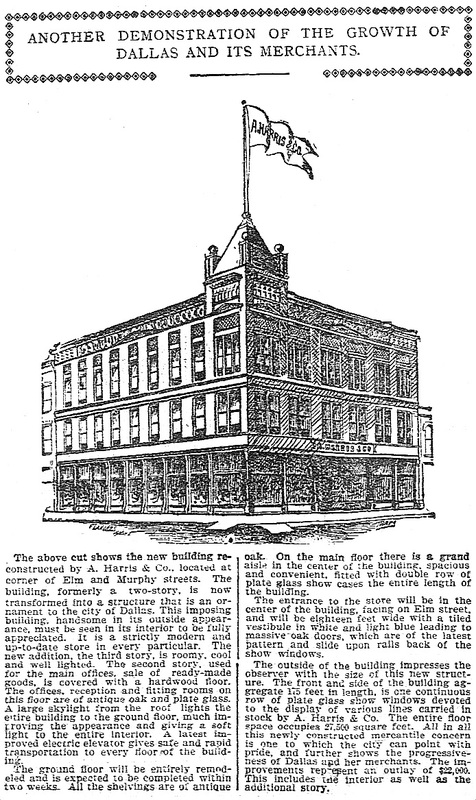 A. Harris Co. eventually outgrew the building, and, around 1914, it moved into several floors of the Kirby Building. 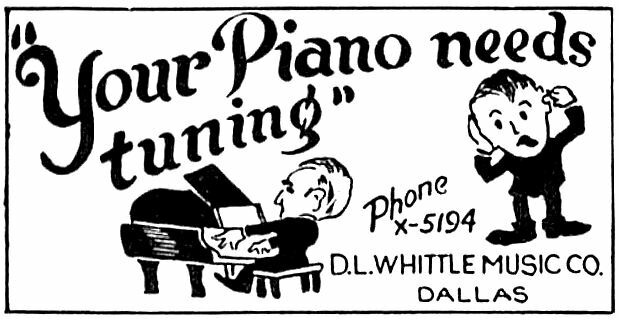 In August, 1941, the Whittle Music Co. moved in from their previous nearby location. 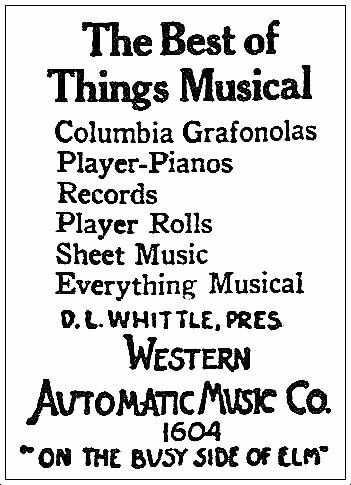 The company which sold “everything musical” (instruments, radios, phonographs, records, sheet music, etc.) 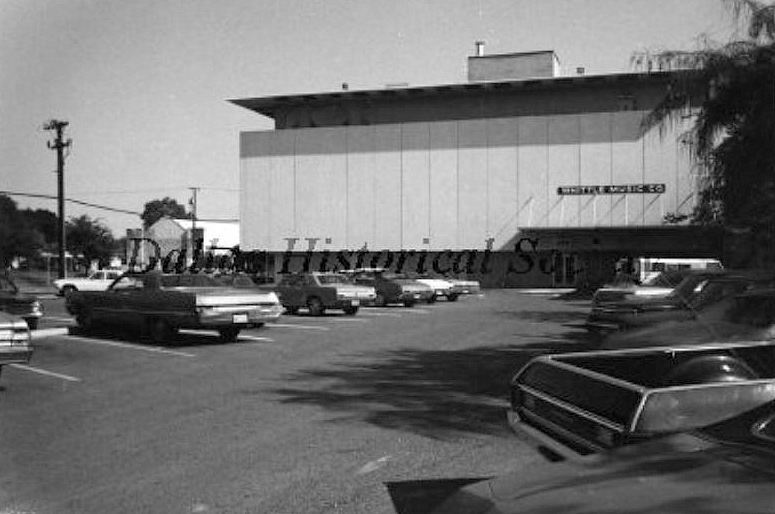 was happy to move into the larger building, which included a basement, an auditorium for performances, meetings, and recitals, and several large display windows to better feature their large selection of pianos (the building was apparently the first store in Dallas designed to include large windows in which to prominently display merchandise to passersby). 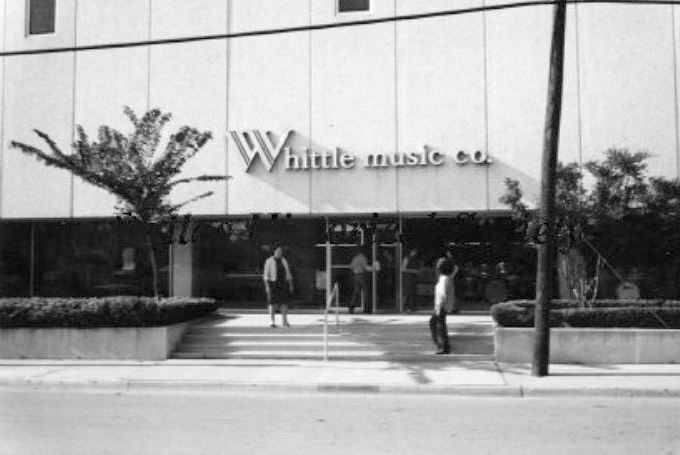 Whittle’s became one of Dallas’ premier music companies, selling instruments and recorded music, offering lessons, hosting performances, etc. According to a Dallas Morning News article by Kent Biffle, customers included Van Cliburn and Arthur Rubinstein, and “Al Jolson once sold tickets to one of his own shows” at the store’s ticket window (DMN, May 31, 1964). 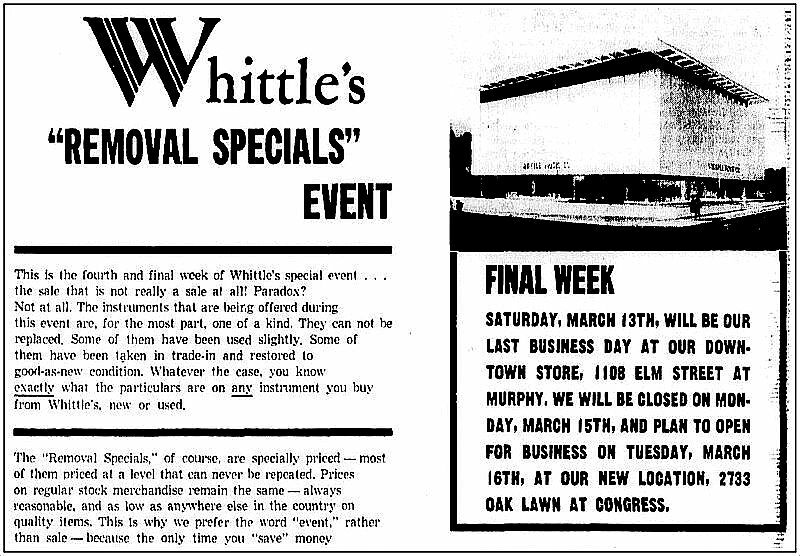 Whittle’s moved into its new location at 2733 Oak Lawn in March, 1965. Not only was it a nice new building, it also finally had “ample parking.” Whittle’s ceased operations sometime in … the ’80s? … but the George Dahl-designed building still stands, here. I’ve never been a huge fan of One Main Place, but it was a VERY BIG DEAL in the late ’60s. It was envisioned as an entire complex — One Main Place, Two Main Place, and Three Main Place — but only one building was ever built. Yeah, we got another tall building out of the deal (the symbol of “dynamic growth!”), but the view of the attractive three-story building in the photo at the top of this post is, let’s face it, far more aesthetically pleasing than the same view today. Sorry, little building. I wish you’d survived. Most images and clippings are larger when clicked. Original source of photo at top is unknown — I found it on Flickr, here. The Oliver Luggage Co. appears to have been a next-door neighbor for only a year or two, beginning in 1956. 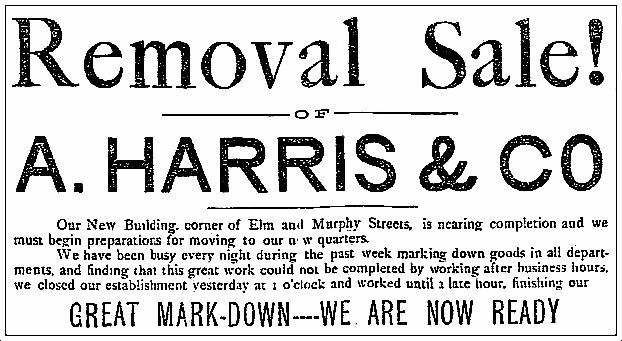 With the Victorians you can never be sure what’s up, but A. Harris’ mention of “Dr. 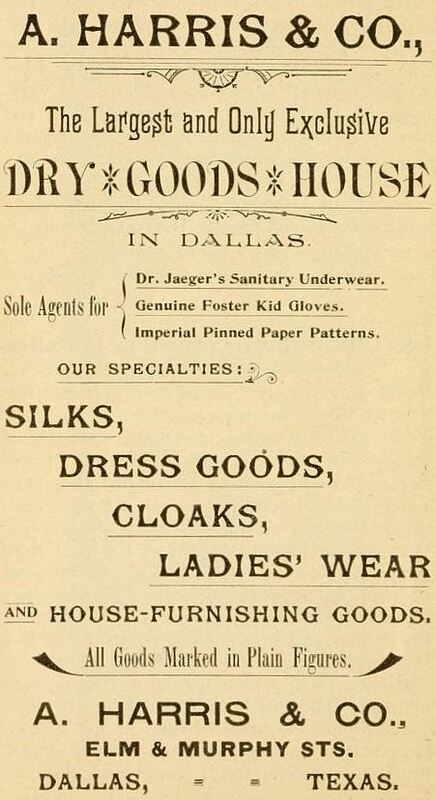 Jaeger’s sanitary underwear” was too much to resist, so I googled. It was woolen long johns. OK.
That was indeed such a special little building. I had never seen this before. I have always been a huge fan of the Whittle Music building in Oak Lawn (having lived there for years) but didn’t know either that it was a Dahl building. Thanks as always! A Facebook post by another former Borders employee got me thinking about the very old cash register that we had and used in the accounting office at Whittle Music Co. when I worked there from 1974-1979. There was a wooden “cage” on the mezzanine level which housed this huge old NCR register that must have dated from the 40s, so it surely came from the downtown location. We used it to make change for the registers on the sales floor, or to make change for employees, and much of the time I was there it was my job to count down all the drawers from those “modern” registers as well as the antique one. I don’t know if I realized that the Oaklawn building was designed by George Dahl, but coincidentally, the job search that landed me at Whittle’s was a direct result of my husband’s lay-off from his job as a project designer at Dahl, Braden, Jones & Chapman. We still have the silver-plated bread tray that we received as a wedding gift from George Dahl!